This month we had all the members who had done the City and Guilds Machine Knitting courses in the past talk about their experiences. In addition, several members who had attended other courses showed us their work. Interestingly many of the speakers had started these course when they had young children. Clearly, they had worked hard in the early mornings and late into the night when their little ones were sleeping. For this alone they deserve our admiration. April started and told us about the process of designing and how they were taught to draw. She showed us images of where the ideas started and how they progressed through sampling colours and patterns to the garment construction. Angie followed this – they had attended the same course – showing how her ideas were created from a fish. Similarly creating the patterns and choosing the colours, eventually putting it together to create a lovely bedspread/throw. Margaret was next and she had gone on to City and Guild’s machine knitting from a broader art and design course, developing her ideas and designs. Then Ann brought along the work created by our late member Marion, who had also been on the course with Angie and April. 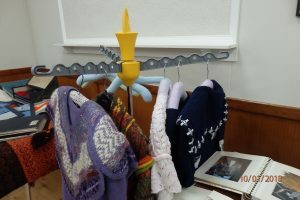 Ann also showed us some of the items she had made after having been on courses in the past. Anu told us of her experience having done this course straight from college. She had spent time developing a business on the back of this. 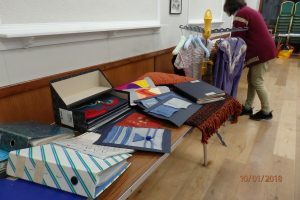 Finally, Anthea showed us all the samples and colours she had used to create one of her Evolution Jackets from the famous Iris Bishop pattern. We look forward to seeing the finished garment.